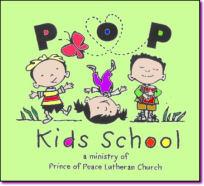 At POP Kids School, our mission is to provide safe and nurturing programs for the children of the community, focused on the enrichment of children through Christian-based values while ultimately preparing them for Kindergarten. We believe that each child is unique and develops at their own pace. We want to ease the transition between home and school while helping your child discover the special place they have in God’s world. As a non-profit school, POP Kids strives to keep our tuition low while keeping the highest educational standards. POP Kids School does not discriminate in student enrollment based on race, color, and national or ethnic origin.